Soldiers of God - Saladin and Richard meet again! When I first joined the forum a kindly Mr. Orc recommended the rules Soliders of God as being good for the Crusades period, so thanks to him. 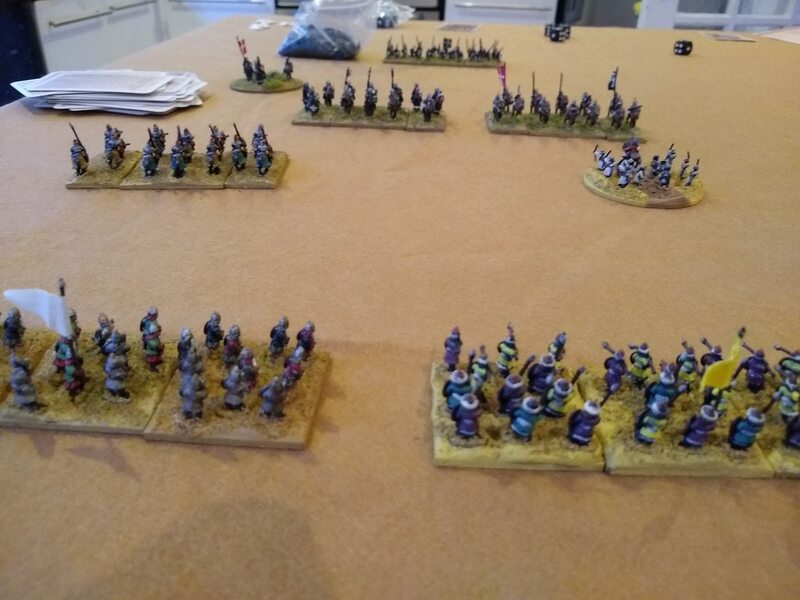 I received them as a birthday gift from my partner this week and after a test game on Friday, decided to put on a proper game yesterday with two evenly matched small armies. The game is driven by action cards with combat resolved with dice. This provides a lot of room for drama and storytelling to unfold throughout the game depending on how the action cards come up! We're in the process of clearing out the kitchen to get a new one put in in a couple of weeks so please excuse any stacks of boxes or piles of rubbish lurking at the corner of the pictures! This made getting good shots and angles somewhat difficult, not aided any by the poor light conditions at present. Once the kitchen is ripped out I'll lose my main playing area (an oversized kitchen island) but will hopefully have more space to put up some fold-up tables for games in future. King Richard and his knights are joined by some detachments from the Holy Orders of the Templars and the Hospitallers to face down Saladin's Saracen horde. 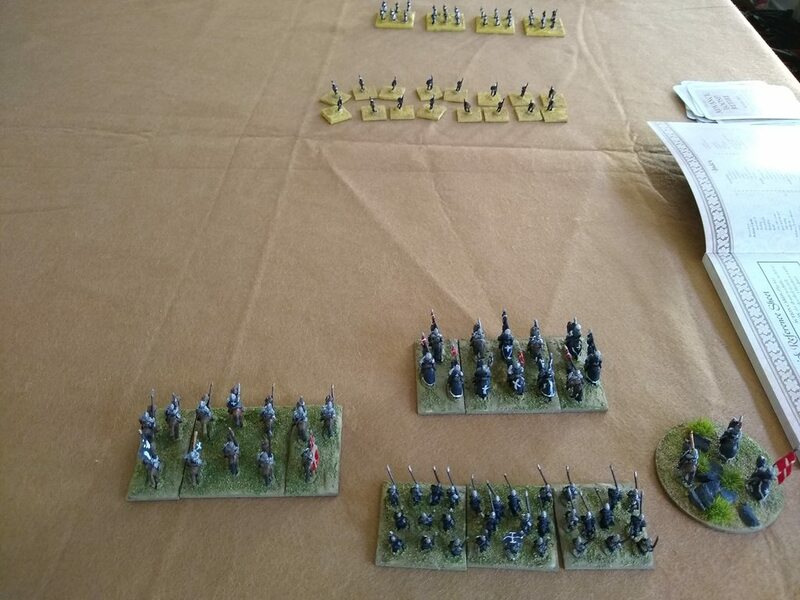 Choosing a right echelon attack battle plan, Richard loaded up his right flank with heavy hitters from the Hospitallers while keeping a solid centre and anchoring his left with the Templars and some Turcopole skirmishers. Saladin spread his forces out quite evenly to provide a wall of archers and skirmishers supported by Mamluke cavalry, Sudanese infantry and a mix of militia and levy troops as a last resort, choosing to hold the line and harass the Christians rather than commit to an all-out attack. 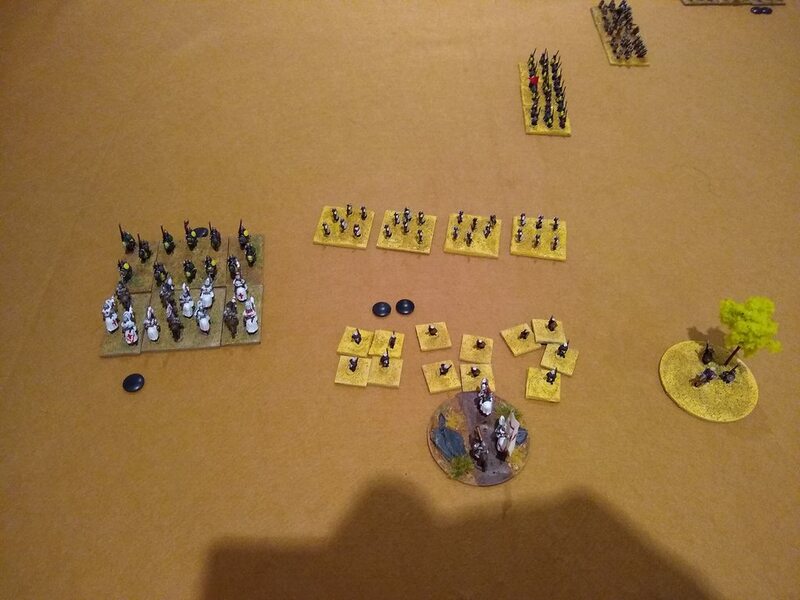 Saladin throws out skirmish screens on his left to try and slow down the Hospitalliers and starts advancing the right to harry the Templars and commands his centre to hold as the Crusaders begin their advance. The men at arms under Richard start to waver a bit as they advance towards the distant Saracen line, but word spreads about the holy relic Richard had recently acquired and carried into battle, no less than the big toe of St. Philmius of Nicea. With such a sure sign of God's favour, the morale of the Christian forces is bolstered. 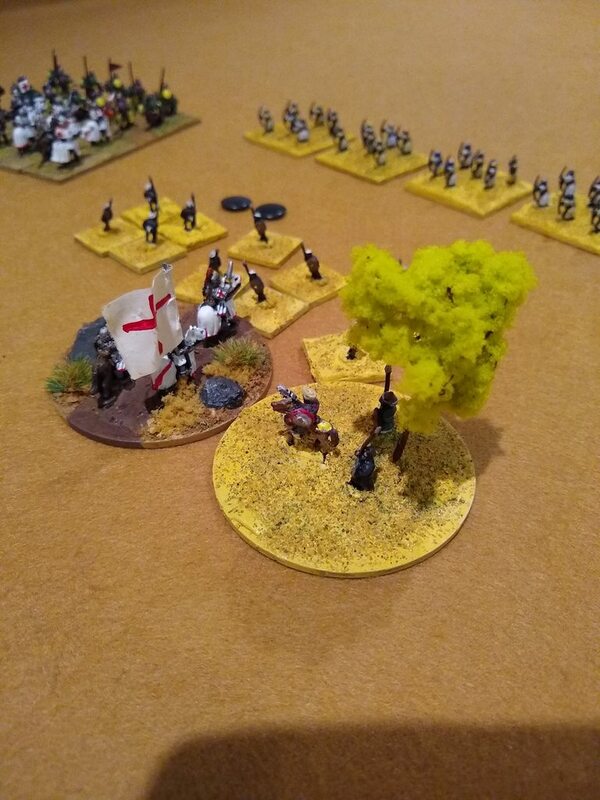 Meanwhile, in Saladin's camp, disgruntled mumblings amongst the Sudanese infantry result in their refusal to follow any further orders until they're paid what they think they're worth! Saladin ignores them for the moment, he has more important things to consider at present. 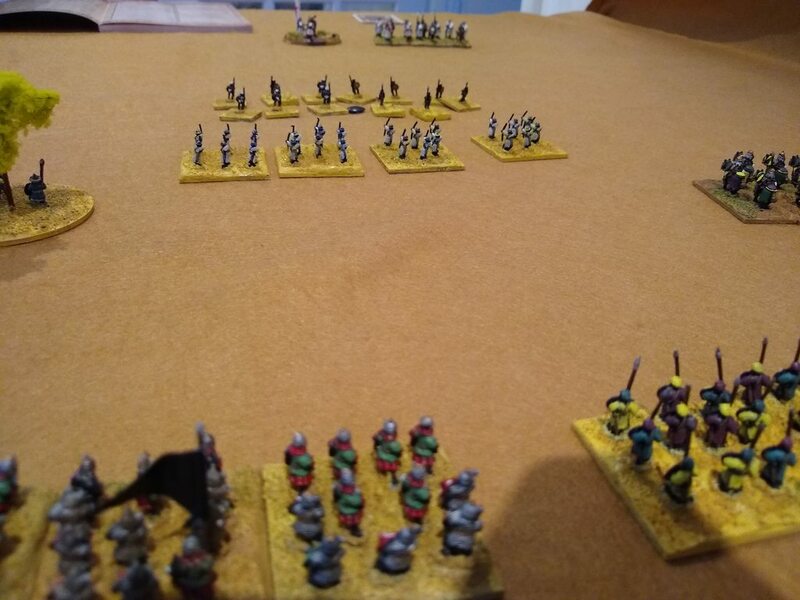 The Hospitallers begin their thunderous advance and some archers flee in terror before them, but their companions remain firm and filled with fire by Allah they surge forward with the other skirmishers and unleash a huge volley of arrows and javelins into the oncoming knights. 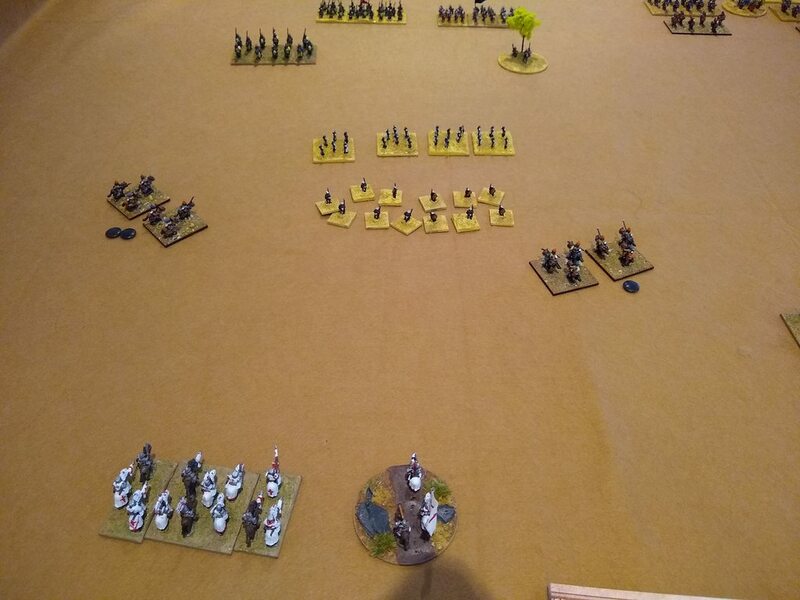 The knights crash into the skirmishers, obliterating them in a bloody massacre, made all the worse by the panicked archers firing into the melee and wiping out some of their own! The morale of the Saracen forces is crushed as the knights press home their advantage and surge into the line of archers. 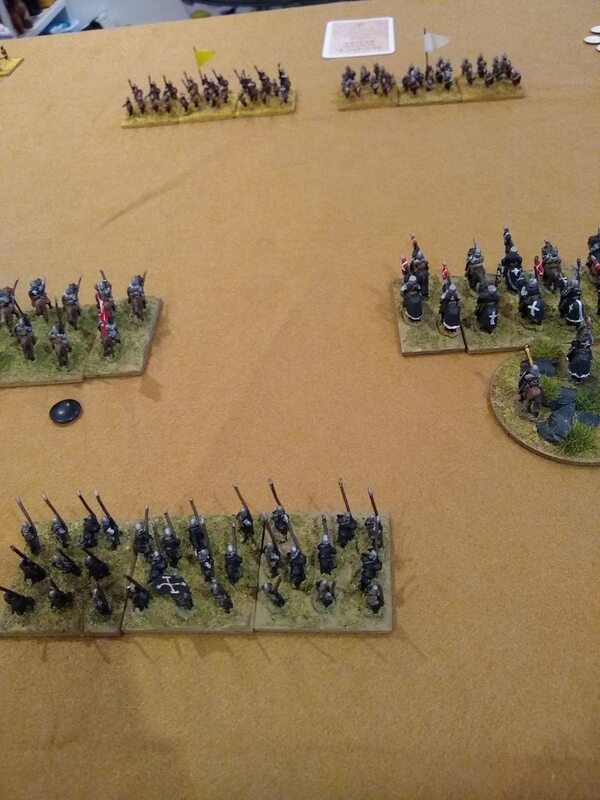 On the opposite flank, the turcopoles are pushing forward to try and sweep away the skirmishers but are met with a face full of javelins that stops them cold. The centre continues its steady advance but surprisingly the archers on the Saracen left, though shaken, manage to hold up the Hospitalliers charge and stall them in their tracks before pulling back to the safety of their lines. Perhaps they wished to wash away the shame of killing their own with the blood of the infidel. The turcopoles continue to come under vicious assault by javelins and arrows, dropping men and horses to the blood-soaked sand. The Christians in the centre march on forward but the bloodshed to their left causes the men at arms, already less than steady become even more shaken as they march inexorably towards the solid Saracen line past the hail storm of death ripping apart the wing. 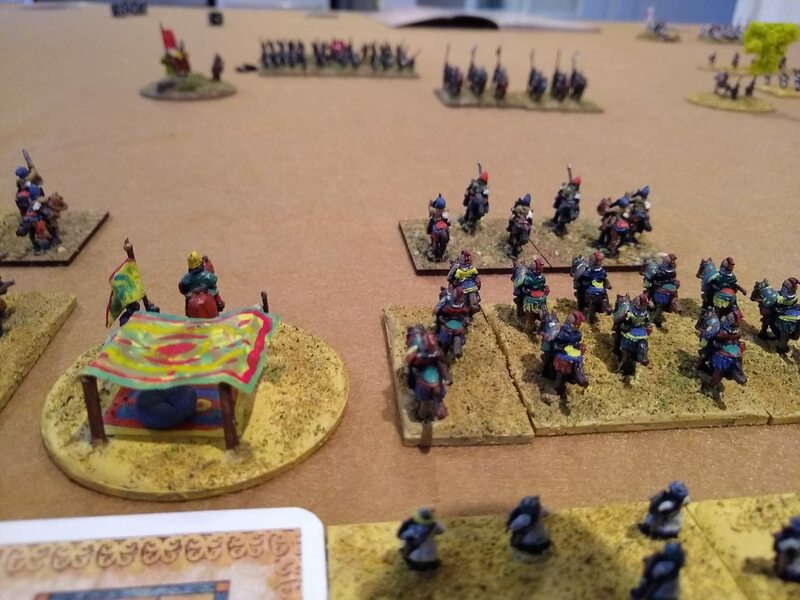 Saladin commands his right to push the advantage against the now routed turcopoles and put pressure on the Templar flank while the Hospitallers charge once against into the archers, destroying them once and for all and preparing to meet the Saracen cavalry on the next charge. In the centre, Saladin's forces unleash a cloud of arrows towards the oncoming Crusaders, but too soon and they all fall short. The Christians push ever onwards, the centre marching headlong into a wall of missiles as the Saracens launch volley after volley at them, slowly wearing them down. On the Hospitaller flank, the knights press on and crash into the Mamluke cavalry causing devastating losses for the Muslim force. 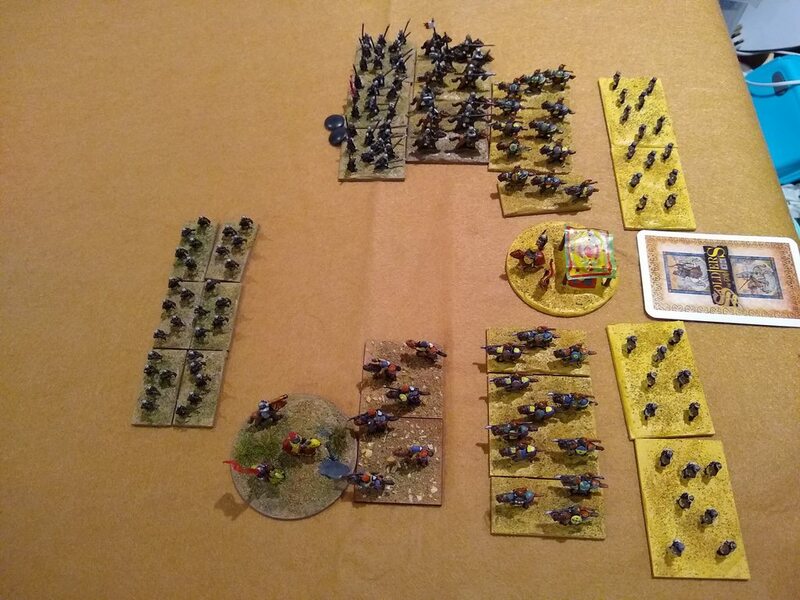 Allah was with them and they rallied valiantly to continue the fight, but the Hospitaller assault was relentless and finally routed the Mamluke cavalry from the field, killing the commander of the flank in the process and leaving the infantry wide open to the next attack. 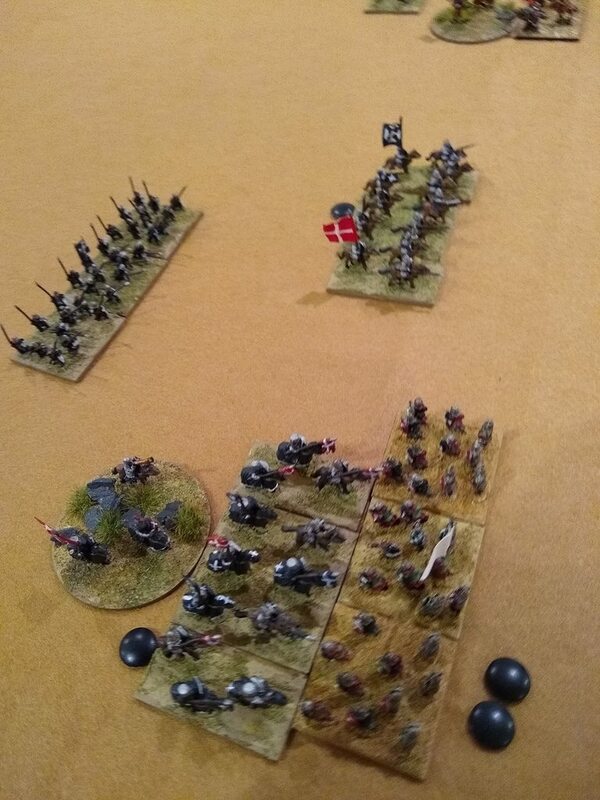 On the opposite flank, the Templars were coming under increased pressure from Mamluke cavalry, archers and skirmishers as missiles keep them at bay. The Crusader centre finally grinds into the Saracen centre and routs some of the horse archers in a bloody brawl. Momentum wasn't with them however and the advance stalled while everyone prepared for the next slog. Finally tired of the torrent of pinpricks the Templars unleash a furious charge against the overconfident Mamlukes while the commander leads his bodyguard at a gallop to wreak merry hell on the skirmishers. In the centre, feeling the pressure from the Crusaders, Saladin agrees to a few more bags of gold to the Sudanese to bolster their lines in preparation of the Crusader advance while in an epic clash between a renowned Saracen champion and King Richard himself, Richard strikes the killing blow, shaking the Saracen troops who stood witness. The militia on the Saracen right, far from the action of their compatriots, see an opening on the Crusader centre and wheel to prepare a charge in. 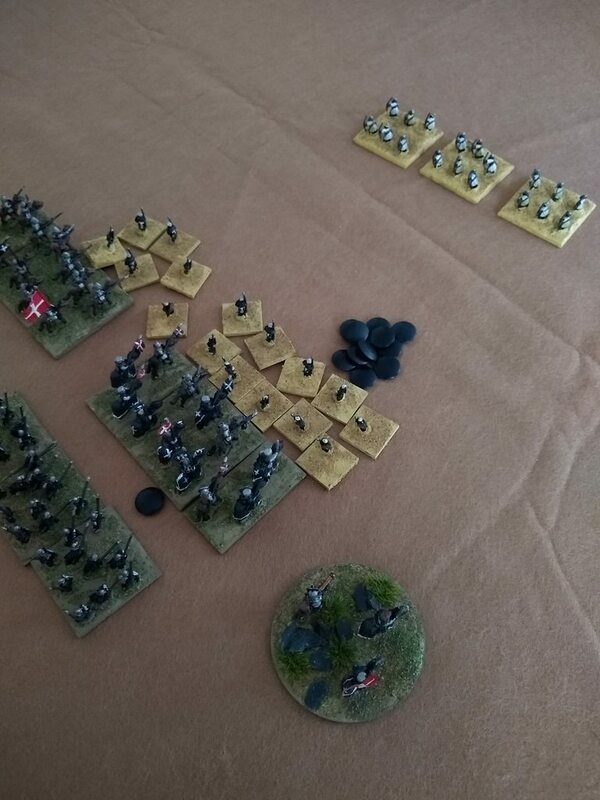 The Hospitallers, fatigued from their continuous fighting, hit home against the infantry but break many horses and men against the awaiting spears. 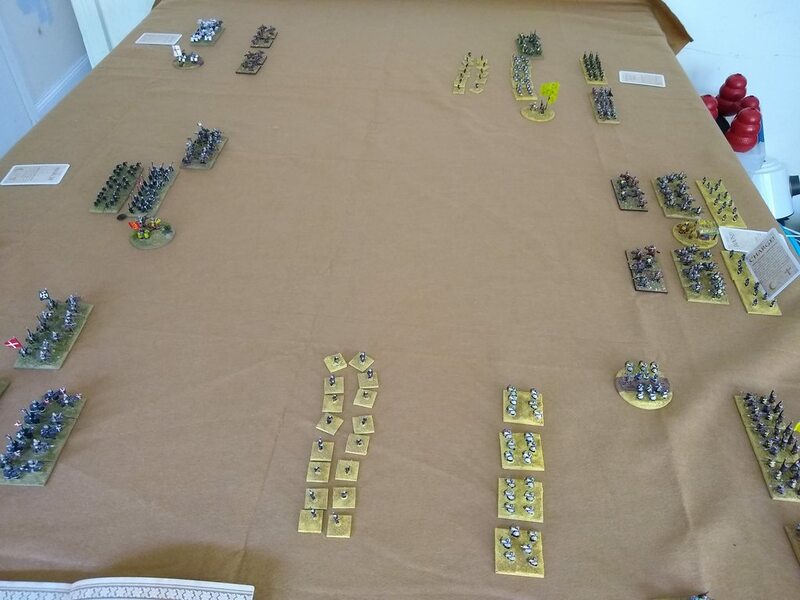 The men at arms in the centre begin to waver again at the sight of the militia moving at their flank but inspired by Richard they push forward regardless to support the knights ahead, who are advancing into a cloud of arrows to meet the next line of Saracen forces. Hoping to break the Templars, a Saracen commander charges his bodyguard into the exposed flank of the Templar commander's bodyguard while he's distracted chasing skirmishers. 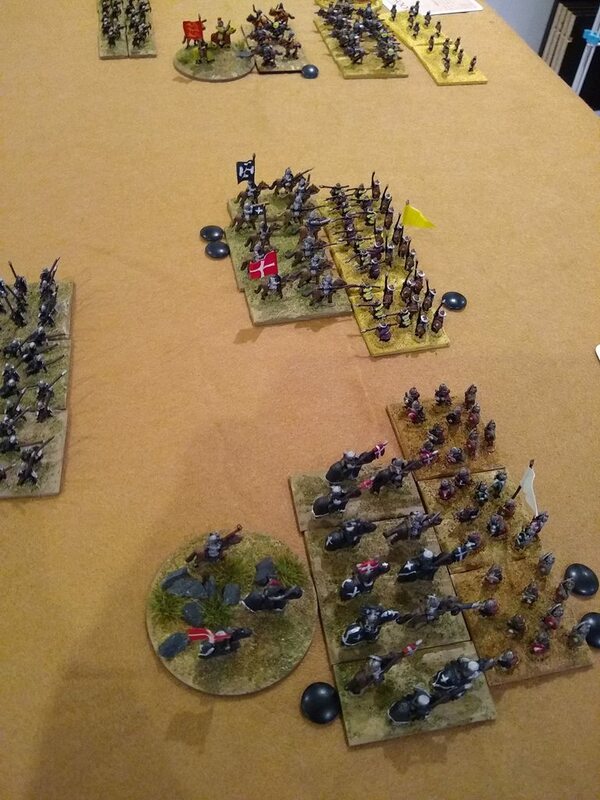 The steady knights, unperturbed by the flank attack strike back with losses on both sides. 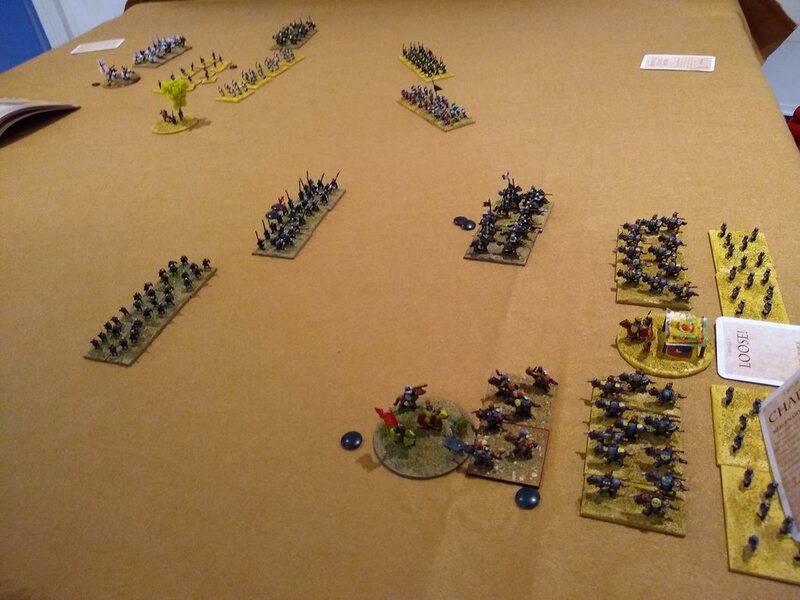 The Hospitallers churn through the infantry on the flank with renewed vigour, while the battle is joined in the centre and the clash on the far flank ebbs and flows between the Templars and the Mamlukes. 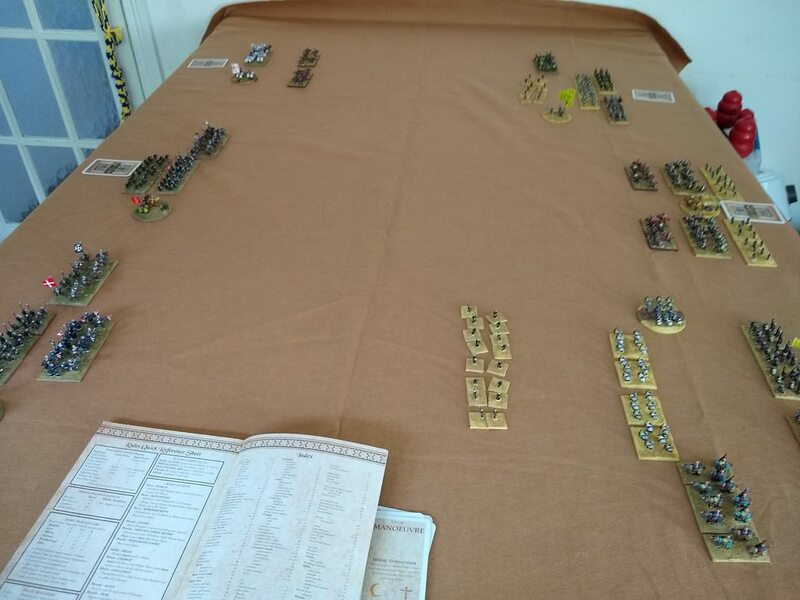 The attrition on combat wears both sides down, but the quality of the Crusader troops holds them together and when the Hospitallers finally collapse the Saracens left flank, Saladin's army breaks and runs in disgrace. The Crusaders hold the field and the road onwards is clear...for now. It was a good game, lots of back and forth between the two sides. For a while it looked like the Saracen archery would carry the day, but the Hospitaller advance turned the tide in the end. In my test game, it has been a bit of an attrition grind without much happening for long stretches. I went with smaller forces this time and it seemed to work out better without the battlefield getting bogged down. Interesting to see just what impact the battle plans can make and how they lock you into a certain predetermined action, much as a general would have been at the time. There is enough flexibility to make some decisions within that battle plan, but the game proceeded along the same lines as the original plans put in place. This gives a nice bit of historical flavour to the game. 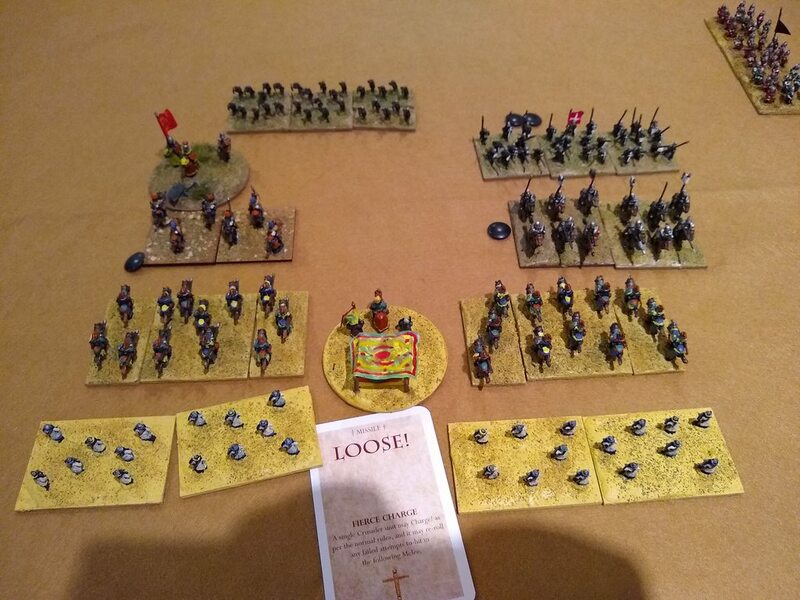 Re: Soldiers of God - Saladin and Richard meet again! P.S. thanks to Techno/Phil for the advice about not having an apostrophe in the title! Glad it worked this time. Why the aposstroffe (sic) causes the problems is.............Errrr.....Don't know. Cheers - Mr Computer Illiterate. I suspect because you can use them to "inject" code into a database if it isn't properly secured so the forum settings are overly paranoid and prevent it in a somewhat dramatic faction! Great looking game. That title shouldn’t have an apostrophe anyway, unless it was originally God’s Soldiers. The artist formerly known as Dour Puritan! No you're quite correct Leman, was a phone autocorrect job and I never noticed. I blame the head cold I'm at war with! I see now it has done it in the main post too. Exactly.....Just what I was going to suggest. Nice AAR and they sound like a good set of rules . 2017 Paint-Off - 2 x Winner! Gald you like them MMCV. We have found them very enjoyable, and have also used them for Mongols V Russians . They seem to work for any two protagonists that are vaguely Christian/Muslim. I suspect they would work for other periods if you replaced some of the more specific cards. My aim in life is to P*ss off one person a day. Currently I am 3 years 1 month and 23 days ahead of schedule. The cynics are right nine times out of ten. -Mencken, H. L.
Thanks for the recommendation! Yeah the actions themselves could easily be transferred to other theatres of ancient/medieval warfare with a bit of fluff tweaking. The morale system is interesting compared to scenario or victory point games I've played in the past.